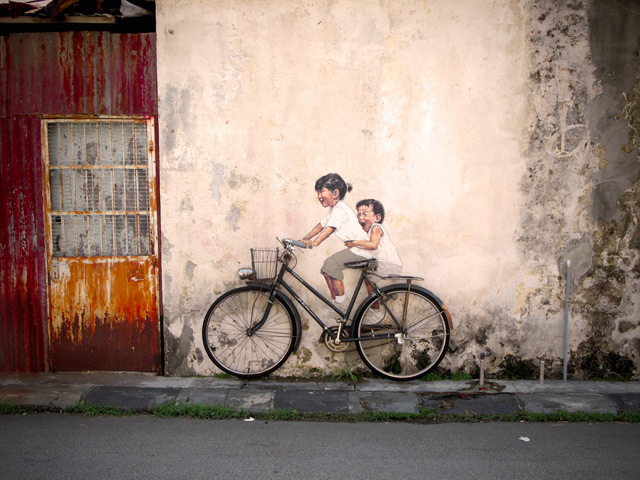 Today’s offering comes from the beautiful land of Malaysia where artist Ernest Zacharevic has created a series of beautiful street paintings of playful children interacting with their surroundings. The delicate detail found in these paintings is one not often found in traditional graffiti or street art and the works have become so popular that tourists now come to have their photos taken next to them. Any art that makes us smile is a winner in our eyes, and we think this is the perfect antidote to a stressful week and the start of the weekend! Happy Friday!